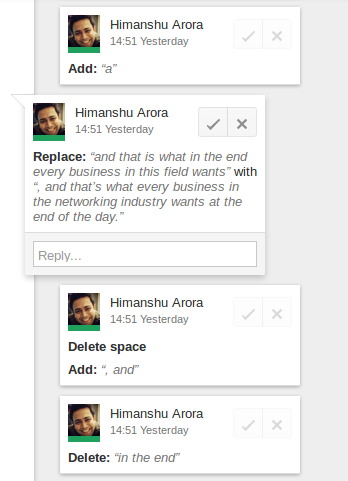 There are times when, while editing a document in Google Docs, you might not want to make direct changes. Rather, the aim could be to suggest changes, effectively leaving it up to the other person (to whom changes are addressed) to either accept or reject them. I know many of you would have been through such situations. And in case you still don't know how to do this, you'll be glad to know that's exactly what we'll be discussing here. 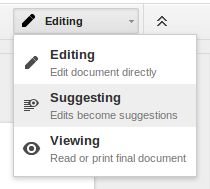 It's quite easy - all you have to do is to open the document in Google Docs' Web client, and select 'Suggesting' from the mode menu located towards the top right. The menu in question usually has 'Editing' enabled by default. Once this mode is one, any editing you do will be shown in a different color, and the original text (that has been edited/deleted) will still be present, although with strike-through formatting. For each change you make in the Suggesting mode, a comment is added. These comments show up on the right hand side. You and the person concerned (for whom these changes are) can discuss each comment by using the Reply... text area in the comment box. Depending on whether the comment gets accepted or rejected (you can do this using the tick and cross buttons located in top-right of each comment box), the corresponding crossed or newly-added text will be removed. Finally, in case you want to view revision history of the document, you can do that by heading to File->See revision history.